તા.૧ એપ્રિલ,૨૦૧૨ ના રોજ વલસાડના અખિલભાઈ અને તેમના ધર્મ પત્નિ તૃપ્તિબેન વડગામ ના આંગણે આવી પહોંચ્યા,મહેમાન તો અમારા ખરા જ,પણ આ મહેમાન મહેમાનગતિ ની સાથે સાથે વડગામ ને કંઈક આપવા વડગામ ના બાળકો,યુવાનો અને વ્યક્તિઓના જીવન વિશે ના વિચારો જાણવા અને ઓનલાઈન વિડીયોના માધ્યમથી વૈશ્વિક લેવલે વડગામને નવી ઓળખ અપાવવા પોતાનો કિંમતી સમય,શ્રમ સાથે સહકારની ભાવનાથી વિના મૂલ્યે સેવા આપી છે જે બદલ વડગામ ગામ વતી તેઓશ્રી નો આભાર. તેઓશ્રી નું કાર્ય તો પ્રશસનિય છે જ,સાથે સાથે સર્જ્નાત્મક અને વાસ્ત્વિક કહી શકાય તેવા પ્રકારનું છે,ગુજરાત ના અનેક વિસ્તારો માં ફરતા લોકોને રૂબરૂ મળીને અનેક વિષયો ઉપર માનવ જીવનના અનુભવનું ભાથુ તેમણે મેળવ્યુ છે,અને આ અનુભવ થકી પોતાના વિચારો તેમના સમ્પર્ક માં આવતા મિત્રો સાથે તેઓ વહેંચતા રહ્યા છે.તેઓ શ્રી એ આ મુલાકાતો ના અનેક વિડીયો બનાવ્યા છે,જે તેમની વેબસાઈટ www.akhiltv.com ઉપર મુકેલા છે. તા.૧ લી એપ્રિલની તેમની વડગામની ૧ દિવસની મુલાકાત દરમિયાન Understanding Life વિષય ઉપર વડગામ ના યુવાનો,કિશોરો અને વ્યક્તિઓને પૂછેલા પ્રશ્નો અને મળેલ જવાબો માંથી ત્રણ વિડીયો તૈયાર કરીને તેઓશ્રી એ મોકલી આપ્યા છે.તો ચાલો જોઈએ,સાંભળીએ વડગામ ના પાવન, સુનિલ, ધવલ, જિગર, ચિરાગ અને ફતાભાઈ ધુળીયા અખિલભાઈના પ્રશ્નો નો શું જવાબ આપે છે ? such as property and position. All that is gained at the expense of the nerves, decade after decade, and is confiscated in the fell night. That is the question of life. The fundamental precept of the fight for longevity is avoidance of safety. One must not lose desires. They are mighty stimulants to creativeness, to love, and to long life. Live dangerously. Build your cities on the slopes of Vesuvius.I would quite be remains than dust! I would rather that my spark should burn out in a brilliant be on fire than it should be barely audible by dry-rot. I would rather be a outstanding meteor, every tiny part of me in magnificent glow, than a sleepy and permanent planet. The proper function of man is to live, not to exist. I shall not waste my days in trying to extend them. I shall use my time. To live is like to love – all reason is against it,and all healthy instinct for it. Life is a romantic business. It is painting a picture, not doing a sum – but you have to make the romance, and it will come to the question how much fire you have in your belly.A rock face in front of you, and wolves behind you, in your rear; that is life. # It was previously a question of finding out whether or not life had to have a meaning to be lived. It has now become clear, on the contrary, that it will be lived all the better if it has no meaning. The world itself is but a large prison,out of which some are daily led to execution. Reason thus with life;If I do lose thee, I do lose a thingThat none but fools would keep.The value of life for us, measured simply by what we enjoy (by the natural end of the sum of all our inclinations, that is, by happiness), is easy to decide. It is less than nothing. For who would enter life afresh under the same conditions? All the world’s a stage,And all the men and women merely players;They have their exits and entrances;And one man in his time plays many parts. But soon we shall die and all memory of those five will have left the earth, and we ourselves shall be loved for a while and forgotten. But the love will have been enough; all those impulses of love return to the love that made them. Even memory is not necessary for love. There is a land of the living and a land of the dead and the bridge is love, the only survival, the only meaning. Appreciate once again a great initiative from your end. Would like to meet you personally while i comes to Gujrat next time and share my view about this site personally rather than writing on this wall. Keep the spirit always on as so many people takes such initiatives but do not continue to upgrade themselves and finally they loose focus. It’s being more than a year since i have seen your website and everytime i found something innovative addition to this website. Simply great.. I wish from the bottom of my heart for sporty spirit to make Vadgaam special in this e-edge world.. 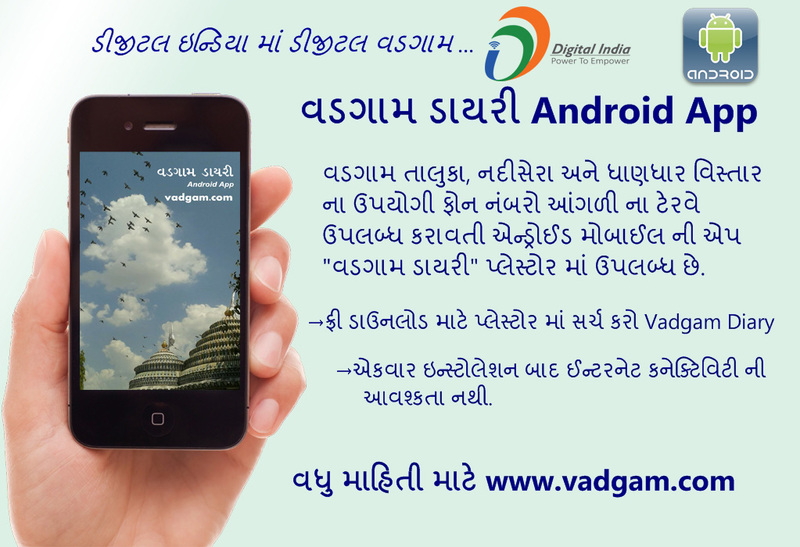 Thank you Rahulbhai for your kind words….Such type of comment encourage me to make website useful for vadgam community…. Yes you are welcome to suggestions and most welcome to meet when you are comes to Gujarat…..Pl.contact when you are comes to vadgam.